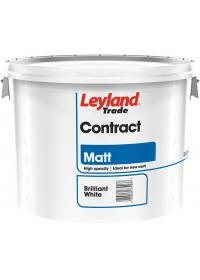 Leyland Contract Matt : - is a high quality emulsion paint specially formulated to provide a full-bodied, high opacity matt finish to all interior walls and ceilings, making it ideal for new work application. Contract Matt is suitable for interior use on new and aged plaster, wallboards, concrete, cement rendering, blockwork and brickwork. Leyland Contract Silk : - is a high quality emulsion, specially formulated to provide a full bodied high opacity silk finish to all interior walls and ceilings, making it ideal for contract work. Contract Silk provides a washable silk finish, suitable for decoration of public areas and is ideal for highlighting the patterns of embossed wallcoverings. ​Matt emulsion suitable for use on new bare plasterwork and plasterboard as a basecoat or as a finish in its own right. Quick and easy to apply, this is a budget product for trade and DIY. ​Silk emulsion suitable for use on new bare plasterwork and plasterboard as a basecoat or as a finish in its own right. Quick and easy to apply, this is a budget product for trade and DIY. It will cover up to 12 square metres per litre. Touch dry within 2 hours, with 4 hours between coats. Leyland is a world recognised brand for emulsion and gloss paints. It is perfect if you want to create a contemporary look as the matt finish is tough and wipeable and great for disguising uneven surfaces. It is easy and friendly to use, and has very little smell as it is water based, which also means it is quick and easy to clean up your brushes and rollers with warm soapy water. It is available in a palette of modern and contemporary colours, and is suitable for walls and ceilings. Leyland is a world recognised brand for emulsion and gloss paints. It is a more contemporary and subtle finish to silk, great for walls and ceilings where a satin finish is required. It is easy and friendly to use, and has very little smell as it is water based, which also means it is quick and easy to clean up your brushes and rollers with warm soapy water. It is available in a palette of modern and contemporary colours, and is suitable for walls and ceilings. Kitchen & Bathroom is a durable, high quality paint that dries to a subtle mid sheen finish. Specially formulated to resist grease, stains and moisture. Suitable for use on interior walls and ceilings.